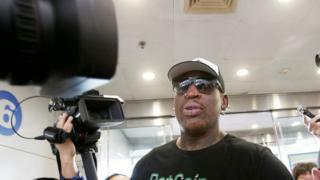 Controversial US basketball star Dennis Rodman is returning for a visit to North Korea. The former NBA player is travelling as a private citizen. "I'm just trying to open the door," he told reporters at Beijing airport, en route to the reclusive state. He made headlines after befriending North Korean leader Kim Jong-un on previous trips to Pyongyang in 2013 and 2014. Mr Rodman has called him his "friend for life". The US state department said it is aware of his visit. "We wish him well. But we have issued travel warnings to Americans and suggested they not travel to North Korea for their own safety," said US Under Secretary of State Thomas Shannon, according to Reuters news agency. Mr Rodman told reporters, "My purpose is to actually see if I can keep bringing sports to North Korea, so that's the main thing." It is unclear whether he will also bring up the detention of US citizens in the country. US and North Korean tensions have intensified under President Donald Trump, who has said he fears a "major, major conflict" breaking out between the two countries. However, the president has also said he would be "honoured" to meet Mr Kim, in the right circumstances. Speaking at the airport on Tuesday, Mr Rodman said: "I am pretty much sure that he [Trump] is happy with the fact that I am over here trying to accomplish something that we both need." When asked about Mr Rodman's North Korea visits in 2013, Mr Trump told Fox News: "You look at the world, the world is blowing up around us. Maybe Dennis is a lot better than what we have." Mr Rodman had been a contestant on Mr Trump's reality TV show The Celebrity Apprentice that same year. In 2014, Mr Trump flatly dismissed rumours that the pair might travel to North Korea together. The former Chicago Bulls star also once encouraged former US President Barack Obama to "pick up the phone and call" Mr Kim, emphasising that the two leaders both liked basketball. His trips have been referred to as "basketball diplomacy" in the US press. In 2014, Mr Rodman told luxury lifestyle magazine DuJour he had approached the US government for support but was rejected. Although at one point he did tweet Mr Kim to ask if he would "do me a solid and let Kenneth Bae loose" - referring to a US-Korean missionary who served two years in prison for trying to overthrow the government. Mr Bae later thanked Mr Rodman for raising public awareness of his case. On Twitter on Tuesday, Mr Rodman said his latest trip was being sponsored by a company that provides digital currency for the marijuana industry. He wore fully branded clothes to the airport. A previous trip to the country was sponsored by a betting company.